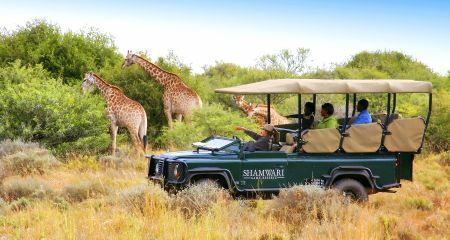 A family safari can be a wonderfully rewarding holiday, as long as you choose your safari lodge carefully. A number of safari lodges now offer children programmes for their younger guests. Whilst just about every safari lodge is suitable for older children, children under the age of 12 are not catered for at many lodges and so families do need to make sure that they pick a lodge that will suit the whole family. There are a large number of lodges that do welcome younger children, but it is worth remembering that all the lodges right across South Africa will not allow children younger than 5 to go on the long adult game drives due to safety reasons - especially when driving into lion and leopard sightings. Each lodge has their own rules, however, about the age that children can join the adults on a game drive, and you should check exactly what your children will be able to do at your chosen lodge when booking - only finding out when you check in that your 8 year old cannot go out to see the animals can ruin your whole family's time on safari! A growing number of lodges offer a dedicated children's programme specifically for their younger guests, or at least provide child care/babysitting services if they are too young to join the adults on the game drives. Families with younger children often choose to go to a non-malarial area such as the Eastern Cape, Madikwe or Pilanesberg, or The Waterberg. The Eastern Cape is particularly popular for family safaris as it is the closest major safari area to Cape Town and the Garden Route. Yes. All of the lodges take safety very seriously, particularly where children are involved. Younger children will not usually be allowed to take a room on their own (i.e. without an adult sharing), and they will normally not be allowed to join in with bush walks. Always make sure you have good sun protection cream and lotion to protect them against insect bites when out on game drives. Ubizane Safari Lodge is set in the heart of the 1,500 hectare Ubizane Wildlife Reserve, and offers daily game drives into the adjacent Hluhluwe Umfolozi Game Reserve. The lodge offers comfortable accommodation in 24 comfortable thatched rondavels looking up at the sweep of Ubizane Mountain. The accommodation comprises of luxury en-suite safari tents that blend unobtrusively with their natural surrounds. The tents offer a remarkable experience - you enjoy all the comforts but you're virtually living out there in the ageless African bushveld. Ravineside Lodge comprises of tranquil thatched wooden lodges on stilts hugging the side of a cliff under Entabeni Mountain and offering a bird's eye view of ravines and hillsides. Each lodge has 3 or 4 luxury en-suite bedrooms with an open plan lounge and bar area that extends to the sundecks.